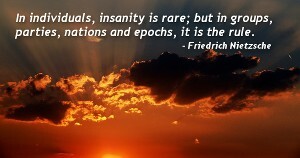 Famous quotes by Friedrich Nietzsche - Quoteopia! Sometimes people don't want to hear the truth because they don't want their illusions destroyed. A great value of antiquity lies in the fact that its writings are the only ones that modern men still read with exactness. A pair of powerful spectacles has sometimes sufficed to cure a person in love. A subject for a great poet would be God's boredom after the seventh day of creation. A woman may very well form a friendship with a man, but for this to endure, it must be assisted by a little physical antipathy. After coming into contact with a religious man I always feel I must wash my hands. Ah, women. They make the highs higher and the lows more frequent. All in all, punishment hardens and renders people more insensible; it concentrates; it increases the feeling of estrangement; it strengthens the power of resistance. All of life is a dispute over taste and tasting. All sciences are now under the obligation to prepare the ground for the future task of the philosopher, which is to solve the problem of value, to determine the true hierarchy of values. Altered opinions do not alter a man's character (or do so very little); but they do illuminate individual aspects of the constellation of his personality which with a different constellation of opinions had hitherto remained dark and unrecognizable. An artist has no home in Europe except in Paris.